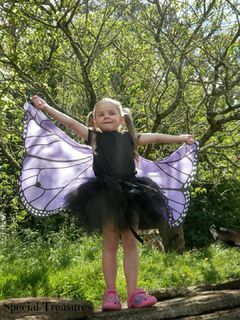 We love creating new designs so please click here to contact us if you would like to design your own tutu. 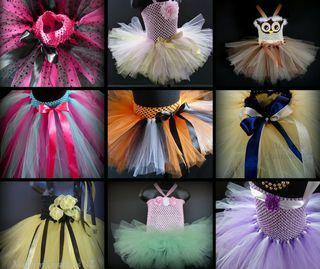 If you are looking for more ideas and inspiration check out our gallery of happy mayhem girls in their tutus. Our rainbow is our most popular skirt and is always a favourite choice for little girls! These skirts offer hours of fun and enjoyment with the bright vibrant colours. If you are looking for a gift or a special occasion outfit for a birthday party then you have come to the right place. 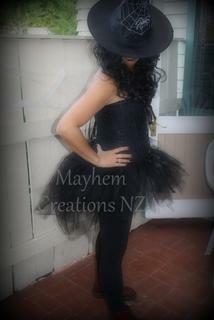 Each tutu skirt is hand tied by me, in Auckland but we send nation wide and the price includes delivery. If you are planning a birthday party with a rainbow theme - we have the perfect choice of outfit for the birthday girl! The band colours can be changed and we can mix up the colours - check out our photos in our gallery for examples of different rainbow tutus that we have made. 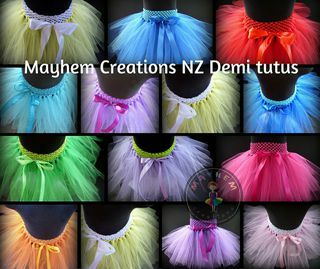 Mayhem skirts are a bright fun and affordable option for anyone wanting a rainbow tutu in NZ! This gorgeous colour combination is one of our most popular choices, after the rainbow tutu skirt. The colours compliment each other to make a stunning tutu. This stunning blue and white skirt is really popular with our Mayhem fans and includes gorgeous sparkly stars. She is going to spin and dance with a big smile while wearing this tutu. You choose the colour of the tulle and ribbon for the bow. You pick the colour - from ivory, white, pink purple green orange red black blue or yellow. These are lovely full skirts and make stunning flower girl outfits. These skirts can be single colours or multi coloured. Are you searching for a complete outfit? Maybe a 1st birthday or another special occasion? 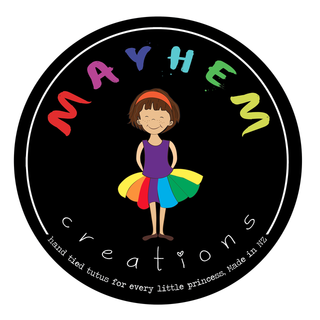 We can design and create a Mayhem tutu skirt with a customised onesie or tshirt to your own design. We are happy to recreate one of our previous designs, or to make something completely new and unique for you. Prices start at $65 and go up to $70 depending on your order and sizing. This includes FREE delivery to non rural address in NZ. 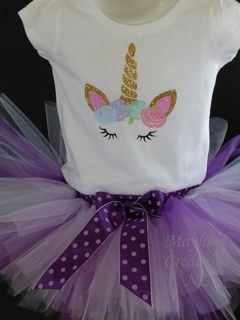 This set includes a Mayhem tutu skirt, a customised onesie or tshirt and also a matching headband. Please add your specific details at the end of the order page, in the comments section. This delightful tutu is a combination of different shades of purple and lavender. With the addition of the spotty ribbon to finish off the skirt - it really has some pizzaz! If you have a little girl who is not a big fan of pink, this could be the answer you have been looking for. A very cute colour combination of pink blue and purple, this tutu skirt is delicious! Its such a vibrant and colourful combination it is sure to catch any little girls attention. If you are looking for a birthday gift idea this could be a great option too because any little girl is going to have hours of fun dancing in this tutu skirt. 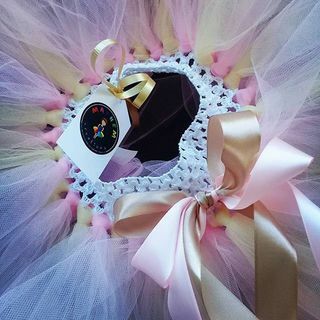 Each tutu is hand tied by me here in Auckland and delivery of your Berrylishiss tutu skirt is FREE (to non rural addresses) NZ wide. If you prefer to pick up, that is an option too. We are about 5 minutes drive from Sylvia Park shopping centre here in Auckland. A gorgeous combo of both gold and pink that will make any little girl want to dance and skip. You can add pink or gold ribbon as the finishing touch to this stunning tutu skirt, or both colours if you prefer. Our Ballerina Rose tutu is one of the most popular colour combinations for first birthday girl outfits and if you are looking for a complete set you can also add a customised onesie to finish the special outfit. Check out our other listings for the tshirt or onesie options. Diana is the name of the Goddess of hunt - and we think that name suits this tutu perfectly! If you have a girl who is not a "girly girl" and into all this pink, then this tutu is just for her. The camo colours suit any outfit for a girl who is into hunting fishing or just anything outdoors. She might be a daddy's girl and want to blend in with him or her brothers. These tutu skirts would be ideal for any girl who just wants to blend in with the crowd, especially with a pack of boys! We can mix and match colours to suit - let us know your preference and we will customise this for you. This tutu is a gorgeous pastel combo of any colours you pick. The colours can include any pastel combination including lemon, mint, peach, pink, blue, white, lavender or gold. At the end of the ordering process is a comments section where you can leave details of what colour/s you would prefer. She is going to feel extra special dancing in this tutu. This super cute pink and purple combo was named by a very clever Mayhem fan! In Spanish Princesita means princess and we think that this cutey is pretty enough for your little girl! If you are going to a birthday party and looking for a gorgeous gift idea then this tutu ticks all of the boxes. The birthday girl will love opening this as her gift on her special day. 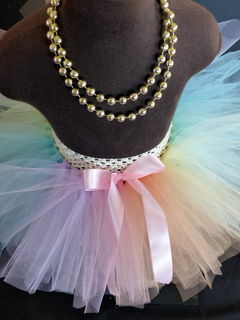 A gorgeous pastel tutu that will be lots of fun to play and dance in. Looking for a tutu without the poofiness? Our single layered tutu demi skirts are ideal for when your child wants a tutu without the fullness of our full skirts. Order online today. A great alternative for a full tutu skirt, our single layered tutu demi skirts are perfect for kids who want to wear a tutu, but without the poofiness! Prices are $18.50 for sizes 1-3yrs and $22 for sizes 4-5yrs. Does your dolly need a matching tutu to? We are happy to make another mini version so your little lady and her doll or teddy can look cute together in their matching tutu set. You can leave the details of what colour you would like in the comments box, after you have entered your payment details. With these super cute dress up sets - you get to pick your favourite Paw Patrol hero from Chase Rocky Marshall Skye Rubble or Zuma. Each set comes with the cape and a mask and teamed up with a tutu will make a gorgeous outfit to have hours of fun playing in! Use this voucher as a gift for a friend or a present. They get to pick their very own Mayhem tutu purchase and can get exactly the design they prefer. Why pick when you can let your recipient do it and get exactly what they want. We are able to send an electronic voucher or a physical one with a gift note if you prefer.